Over the past 48 years I have had the opportunity to visit almost all parts of the Bible World. I certainly have not solved all of the problems that are raised about locations of certain events, but I have tried to look at the major claims whether it is the location of Cana, the site for the baptism of Jesus, the place of the crucifixion and burial of Jesus, the location of Ararat, or the route of the exodus and the location of Mount Sinai, et al. In this post I have pulled together a list of some things I have written about the route of the Exodus and the location of Mount Sinai. I hope you will find the posts helpful when you study this subject. Pharaoh’s chariot wheels and other things that won’t float – Examining the claims of the late Ron Wyatt here. Location of the Red Sea crossing and Mount Sinai here. Location of Mount Sinai here. Solomon’s Seaport at Ezion-geber here. Sharks at Sharm el-Sheikh in the Sinai here. Sharm el-Sheikh is at the Straits of Tiran. Goshen and the Great Bitter Lake here. Another day in Goshen here. 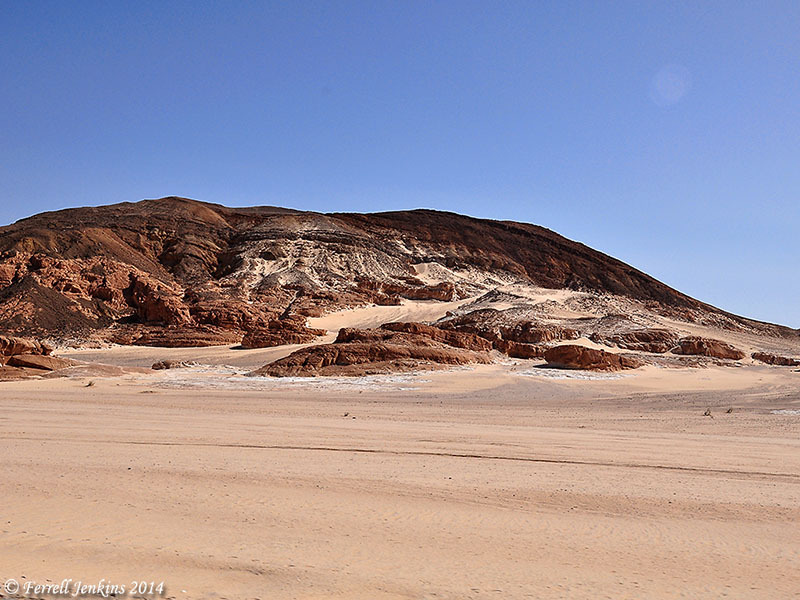 Below are a couple of photos that show the changing scenery that one sees in the Sinai Peninsula. Sinai Peninsula near the Gulf of Eilat or Aqaba. Photo by Ferrell Jenkins. Read some scholarly presentations on the subject. Such as these recent Bible atlases. Beitzel, Barry J. The New Moody Atlas of the Bible, 106-114. Currid, John D. and David P. Barrett. Crossway ESV Bible Atlas, 77-91. Rasmussen, Carl G. Zondervan Atlas of the Bible, 100-105. 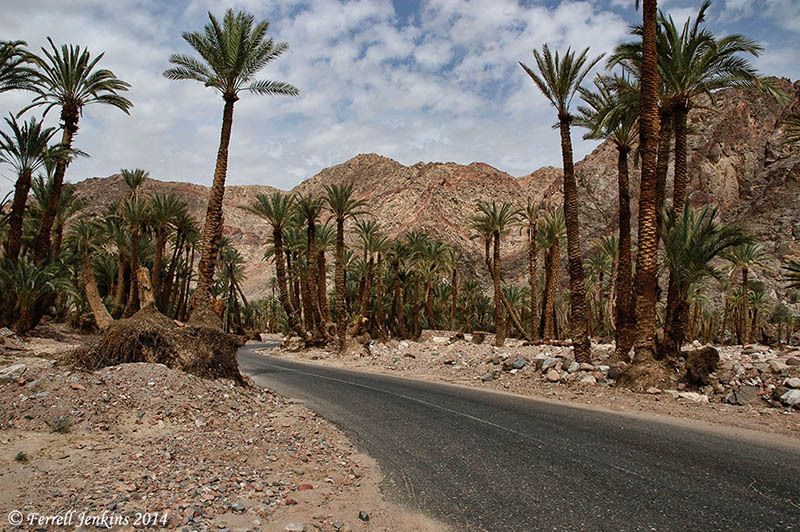 Wadi Feiran in the Sinai Peninsula. Photo by Ferrell Jenkins. Hoffmeier, James K. Israel in Egypt: The Evidence for the Authenticity of the Exodus Tradition, chs. 8-9. The Associates for Biblical Research includes several articles about the Exodus at their website here. Is Mount Sinai in Saudi Arabia? here. Mount Sinai is Not Jebel Al-Lawz in Saudi Arabia here. I am hopeful you will browse through this material and remember to examine it more closely the next time you study Exodus. This entry was posted in Archaeology, Bible Lands, Bible Places, Bible Study, Egypt, Israel, Jordan, Old Testament, Photography, Travel and tagged Exodus, Mount Sinai, Ron Wyatt, Saudi Arabia, Sinai, Sinai Peninsula, The Exodus. Bookmark the permalink. Thanks for posting a summary like this. Please post more! I am sure there are a lot of “gems” in your blog that are difficult for many of us to know that they are there.